The well-known chain saw manufacturer STIHL, based in Waiblingen, near Stuttgart, also manufactures a range petrol cut-off saws. This is where the CR-35iA Collaborative Robot has been put into operation. A cut-off saw weighs around 10 kg, and without the assistance of the CR-35iA, the operator has to handle it himself. Up to now, this has proven to be a considerable burden for the operator. Using the robot should lessen the burden on the employees on the cut-off saw packaging line. On the new packaging line, the task of the robot is to remove the cutting grinder from a suspended conveyor, carry out the shake test, and keep it suspended until a final visual inspection is positively completed. Subsequently, the robot then places the cut-off saw in a shipping box. 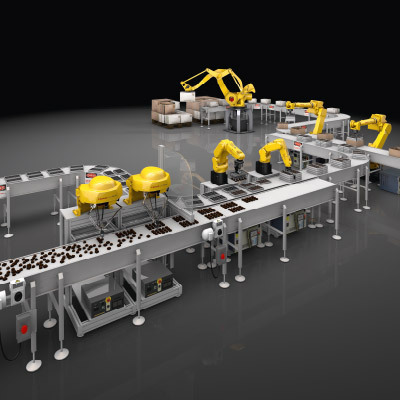 The robot relieves the burden on packaging line employees, while moving at a speed of 250 mm/s. And it takes over the lifting of heavy loads from the workers. As a single cut-off saw weighs around 10 kg, the total conveyed load over a single shift per employee is around 8 tonnes. FANUC “Line Tracking” software and the “Collision Guard” option, which were already very familiar to STIHL, simplify the process. STIHL has been working with FANUC robots in its worldwide operations since the 1990s. Hundreds of robots are already in use at the motor saw manufacturer STIHL, based in Waiblingen, near Stuttgart. Now the first Collaborative Robot has been added. STIHL has taken a clear step forward in the development of technology using the FANUC CR-35iA. The robot relieves the burden on employees on the cut-off saw packaging line. Both handling and programming are second nature to the team, which as André Lange points out, “allowed us to concentrate on implementing the concept of the collaborative workplace”. Last year, the manufacturer of chainsaws achieved a record turnover of € 3.46 bn. Between 2015 and 2019, worldwide company investment in product development, manufacturing and sales was approximately €1 bn. Of this, € 300 m have been invested in the parent company alone – a clear commitment to the German location. A range of products for the professional user, including cut-off saws, are manufactured and packaged at the company's headquarters in Waiblingen. This is where the CR-35iA Collaborative Robot has been put into operation. In the new packaging line, the task of the robot is to remove the cut-off saw from a suspended conveyor, to carry out a “shake test” and then to keep it suspended until the final visual inspection is completed. The robot then places the cut-off saw in a ready prepared shipping box. In this collaboration area, the robot only moves at the permitted speed of 250 mm/s. Before introduction of robot handling at this workstation, the handling and shake test were performed manually by the operator. Basically, the shake test is an acoustic test, whereby the cut-off saw is shaken - but it is an important step in quality assurance and final inspection. If a “clicking” sound can be heard when shaking, then the suction head is installed correctly and the cut-off saw can be packed. As a single cut-off saw weighs around 10 kg, this amounts to a total lifted weight of around eight tonnes per shift, per employee. Therefore, the robot provides considerably relief for the employee. The packing line staff were involved from the outset in the project. Not only were they able to give an expert assessment of the test set-up, they also influenced the design and ergonomics. Markus Wahl, from the Production Engineering department at STIHL and responsible for building the assembly systems, was involved with the robots on a daily basis during the development period: “The packing line employees have introduced many good ideas that we have implemented.” As the suggestions came directly from practical experience, this made both engineering sense and increased the acceptance amongst the workforce from the very beginning. The suspended conveyor has some 80 workpiece mounts. But as the duration of adjustment work on each cut-off saw, during the end-of-line testing, can vary, not all of the workpiece mounts on the continuous conveyor are occupied. On occasions several positions, one after the other, are unoccupied. A loaded hook on the suspended conveyor, on which a cut-off saw is hanging, is recognised by several camera systems along the conveyor track and this information is transmitted to the master controller and the data management. The robot synchronises its speed with the conveyor, via the FANUC "Line Tracking" software, and then grips at the right moment. As Markus Wahl explains: “The goal is to utilise the robot as continuously as possible in order that it has no idle time.” One of many small tricks used is the hanger speed: It has been designed to be variable. So that the robot can be utilised to the fullest extent, there is also an intermediate storage after the hanging conveyor. This buffer is used, for example, when more cut-off saws arrive at the packing station than the employee can inspect, or if he goes for a break. Then the robot works fully automatically. The aim in all situations is to keep the suspension conveyor empty. If the “replenishment” from the assembly is less, the robot works to empty the buffer. A variable at this position is the employee. The times for the individual testing can vary. If the robot misses a workpiece, there are different demolition scenarios. The robot grips the cut-off saw by the two handles, one after the other. Only when both handles are gripped, can the robot remove the cut-off saw from the suspended conveyor. If this does not occur, it waits for the next part. STIHL has developed its own gripper for the CR-35iA. It is based on a conventional gripper. However, this is not openly visible, as the gripper has a covering, so that the protective layer has an additional dampening effect when coming into contact with people. To achieve this, it was necessary for production engineers in Waiblingen to incorporate quite a lot of additional engineering. As a result, the gripper has been developed into an interactive man-machine element. It therefore indicates which mode it is in via LEDs. The red LED illuminates, for example, when the robot is running in high-speed mode at 750 mm/s. The safe MRC (Machine Robot Collaboration) mode is indicated by a blue LED. The illuminated push buttons, located on the gripper, allow the operator to confirm the OK status, or similarly the NOK status, if he has discovered a defect and the cut-off saw held by the gripper must be discharged for rework. If the robot is at a standstill, because the scanners has detected a person in the safety area, for example, then the gripper function is deactivated. As a result, the struggle to meet the operational requirements – 10 kg load capacity, 750 mm/s maximum speed and steep acceleration profile – has been mastered. The ability to use the Collaborative Robot CR-35iA with the normal FANUC control system, just like its yellow “colleagues”, proved to be one of the major advantages: The control technology and user interface are all the same. The system components used, like the FANUC “Line Tracking” software, which is particularly useful for synchronisation with the suspended conveyor system, the integration of camera systems or the proven “Collision Guard” software option, are already well-known and appreciated by STIHL. The CR-35iA has been in daily operation for more than half a year, and satisfaction with the robot is not just amongst the project managers, André Lange and Markus Wahl. It has also been fully accepted by the workforce. Affectionately referred to internally as the Hulk, the Collaborative Robot is something that none of STIHL employees wants to miss. The STIHL Group develops, manufactures and distributes motorised equipment for forestry and agriculture as well as for landscape gardening, the construction industry and the demanding private user. The product range is supplemented by the VIKING range of garden equipment. The products are exclusively sold in more than 160 countries through a network of authorised service agents - consisting of 37 group sales and marketing subsidiaries, around 120 importers and more than 45,000 authorised dealers. STIHL produces in seven countries worldwide: Germany, USA, Brazil, Switzerland, Austria, China and the Philippines. Since 1971, STIHL has been the world's best-selling motorised chainsaw brand. The company was founded in 1926 and has its headquarters in Waiblingen near Stuttgart. In 2016, STIHL generated sales of € 3.46 bn, with 14,920 employees worldwide.